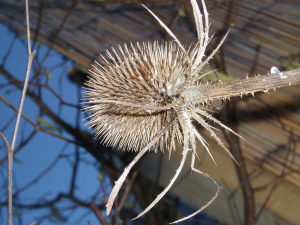 Observation - Teasel in winter - UK and Ireland. Description: Spiky stem, seed head and sepals. Woody. Growing in London clay, waterlogged at predent. Spiky stem, seed head and sepals. Woody. Growing in London clay, waterlogged at predent.